As can be seen, this story contains many contradictions. It is difficult to appreciate the strange mixture of chivalry and expediency, which governed the Luffwaffe’s treatment of its prisoners. They were generally treated with politeness and in accordance with the Geneva Convention. They were housed well away from the battle zone and the fact that they were always hungry was not usually deliberate deprivation. Allied airmen fell into German hands straight from life in the mess where they were given special rations. The standard diet of the German troops was far below that of any Allied serviceman, even below that of British civilians in their beleaguered and overcrowded islands. What was considered a normal meal for their guards was considered by the prisoners to be quite inadequate. 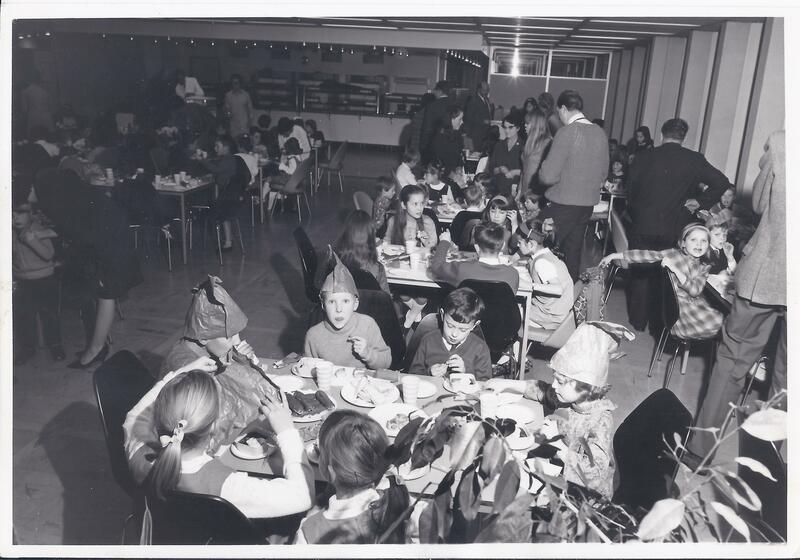 Yet at the war’s end, when the German nation was practically starving, there was an accumulated supply of some 150,000 Red Cross parcels from Canada full of tinned meat, jam, milk, tea, coffee and chocolate in the storerooms of Stalag Luft III. There were millions of cigarettes, crates of pipe tobacco and mountains of soap, all of which the Germans were in dire need of. It say’s much for Luftwaffe discipline that so little of this treasure, hoarded by the prisoners in case supplies failed to get through, found its way on to the German market. The prisoners also received clothing, books, sports equipment and even musical instruments from home. 50, thirty members of the RAF escaped from German camps and returned home, 16 of these were NCOs’. Most of the prisoners responded to the guard’s polite correctness with derision and contempt. Generally, the Germans were referred to as Goons. When they landed at RAF Cosford, they were taken to a hanger, set up as a welcome centre, with flags and welcome signs flying. WAAF’s were on hand to give out tea and they received advance pay, rest and then re-kitted with uniforms and interrogated by intelligence officers. 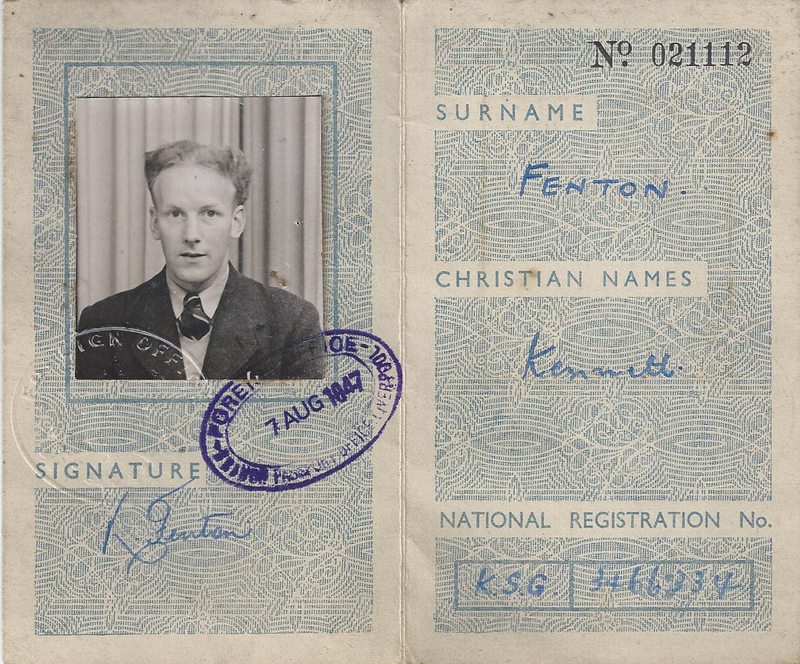 Ken Fenton arrived at 106PRC (Personnel Receiving/reception Centre) RAF Cosford, Shropshire, on the 10th May 1945. 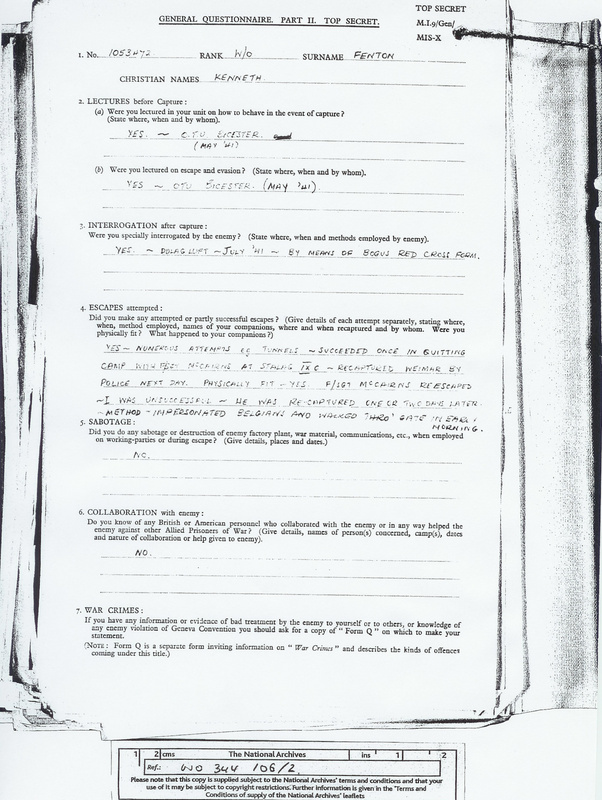 He completed his Prisoner of War Liberation Questionnaire the next day, 11th May 1945. Back in early 1945 a decision was made that all returning RAF ex-prisoners of war would pass through No.106 PRC (Personnel Reception Centre) at Cosford and therefore arrangements were made to accommodate up to 3,600 returning personnel, the facility being opened in March 1945. No. 106 PRC was responsible for the initial reception and medical examinations of the returning POW’s to decide whether they were fit enough to return straight home on leave or whether they required hospital treatment. 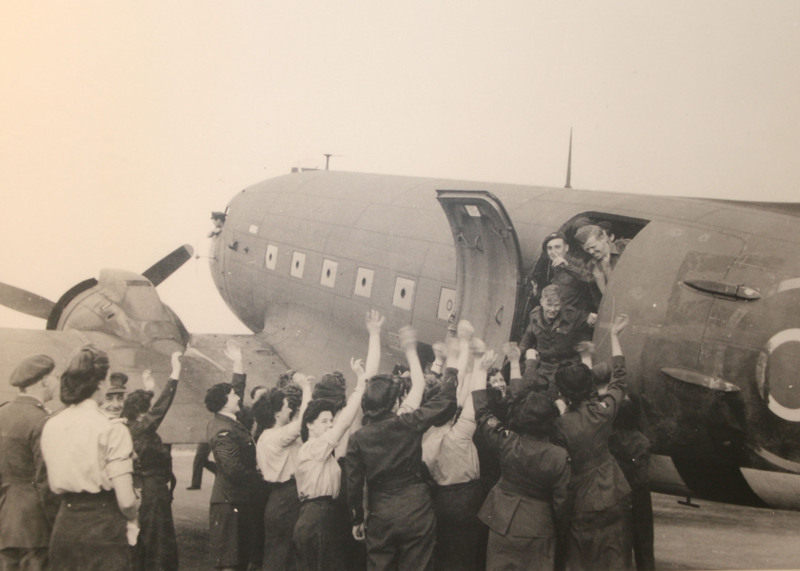 The first group of 99 Prisoners of War arrived on 10th April 1945, 23 of whom were immediately hospitalised for intensive care, this being a group of urgent cases for repatriation. No. 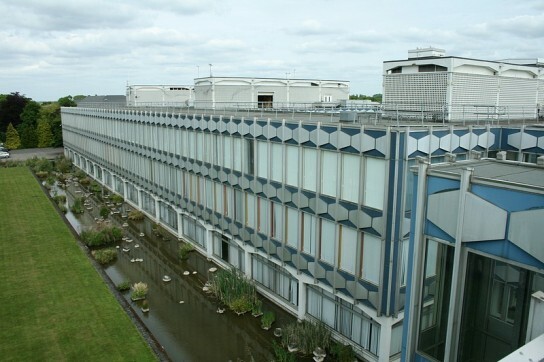 4 Medical Rehabilitation Unit was also located at Cosford to provide medical facilities and expert attention. Ken Fenton, now a Warrant Officer, was put in accommodation in the Fulton Block with the other officers, whilst other ranks were accommodated in Nissan huts at Cosford and fed in the Sergeants mess. They were questioned and examined in No.4 workshop Hanger, which was set up on professional lines so that each POW could pass through and receive the necessary attention as quickly as possible. Here the ex-prisoners were debriefed by intelligence officers, but the level of detail sort varied greatly. They were asked about any German’s who mistreated them, any allies who collaborated with the Germans and any escape attempts that were successful. They were not interested in the stories, there were too many Prisoners of War to process. They were also issued with new identity cards and reintroduced to physical exercise to get them fit. 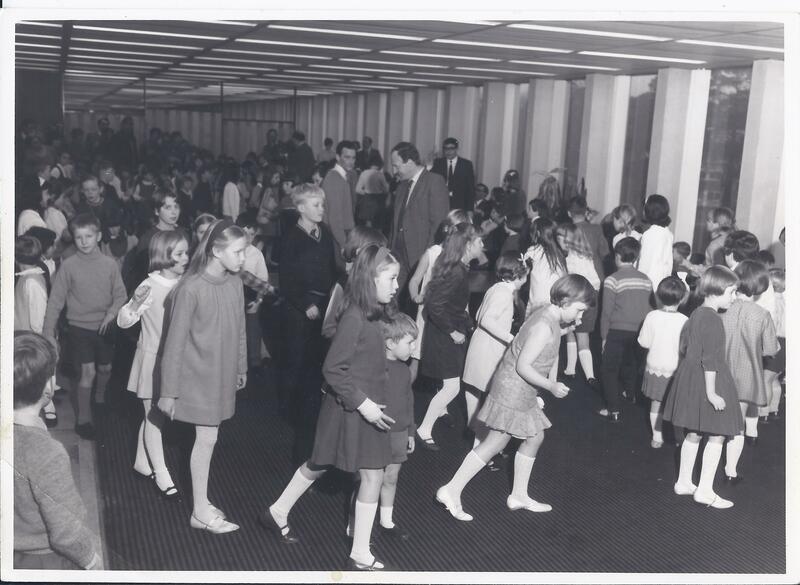 They were also allowed out for the first time and frequented the Civic Hall in Wolverhampton for the weekend dances, partnered by some of the WAAF’s from Cosford, who had been taught very carefully about the returning servicemens lack of female company. Most were suffering with the effects of malnutrition and associated stomach disorders. After a few days or weeks, depending upon the ex-POW’s condition, of good food and attention, they were sent off home to their Mother’s to receive some proper home cooking, with special ration cards to help them regain their lost weight and 28 days leave approved. They were given £20 for their home journey, together with any unpaid back pay that had accrued. During the period 10th April until 4th June 1945, 9,185 Officers and men passed through Cosford, with only 210 being admitted to hospital, but the unit was to cater for a total of over 11,000 whilst No.106 PRU was based at Cosford. These were just the returning POW’s from Europe, later NO. 106 PRU would be called to deal with returning POW’s from the Far East. 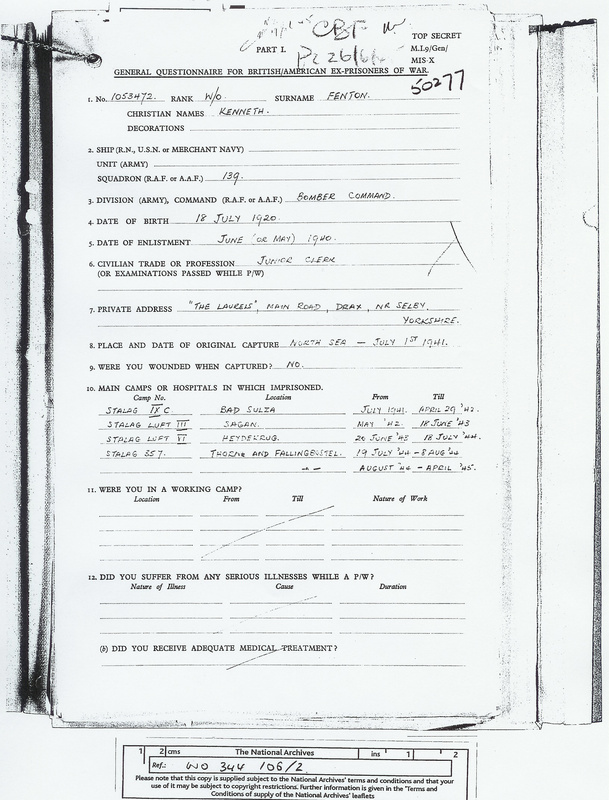 Kenneth Fenton’s Liberation Questionnaire was completed on 11th May 1945. A A Fullers was completed on 5th May. VE-Day was 12th May. 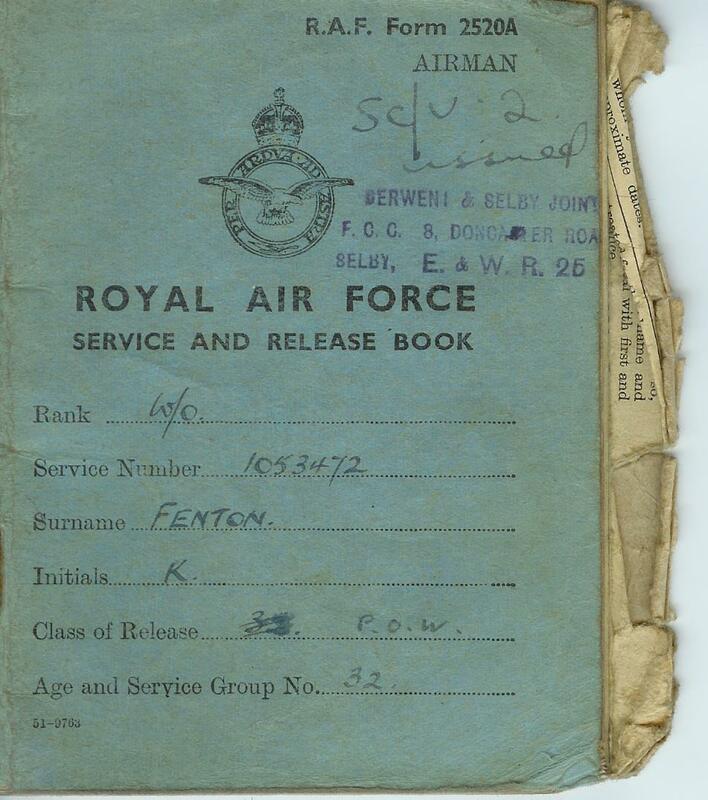 Ken was posted to AMM2 (Air Ministry Movement) on 16th May 1945, this is probably when he was sent home on leave. Lottie Fenton, Ken’s Sister, frequently told the story as to how, she and her Mother, were washing up at their home at The Laurels, Drax, Yorkshire (next to the Huntsman Inn), when one of the villagers came in and told them that Ken was coming down the road, home for the first time in nearly 4 years. She ran out bare foot to meet him at the head of the village. It is believed that he had caught a bus from Selby, getting off at Camblesforth, where he went into the public house before walking the last distance home. 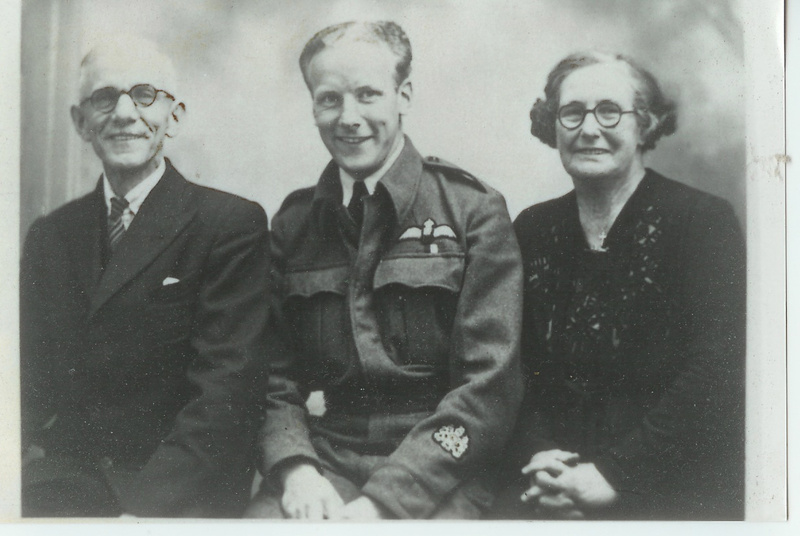 Picture of Ken with his Mother and Father, Robert ‘Percy’ and Annie Fenton taken upon his arrival home for the first time in nearly 4 years. In June 1945, the aircrew returned to Cosford to be further examined and attend a Medical Board Examination prior to discharge. Here they received further medical treatment as necessary or were admitted to hospital or No. 4 MRU for specialist treatment. Off the 10,000 plus returning ex-POW’s, over 500 were admitted to hospital and over 1,300 sent to No. 4 MRU. On 15th July 1945 Ken was then posted to 115 RTC (Resettlement Training Centre) at Ascot. 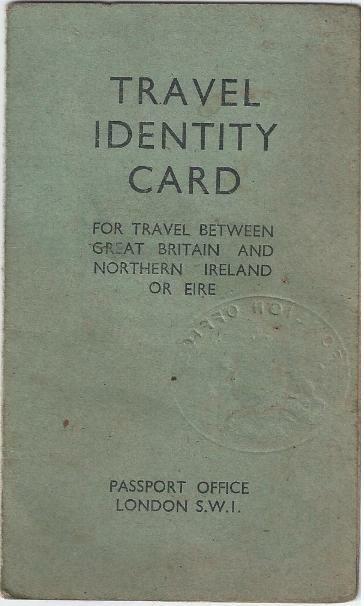 In the Summer of 1945, the Government had decided upon and rolled out a national rehabilitation programme available for all servicemen leaving the service for a civilian trade. These courses were to become compulsory for the RAF aircrew but voluntary for the Army due to the numbers involved, and the RAF aircrew at Cosford were assigned a course as soon as a place became available. For some like Ken, this was pretty immediate, just 2 months after returning to Britain, but for others, they were to receive instruction, extending their leave to three months at home. The course was intended to re-educate and help these returning airmen and other service personnel readjust to civilian life and quickly get a job. The War Office opened up twenty ‘Civil Resettlement Units’ or CRU’s whilst the RAF opened up four ‘Resettlement Training Centres’ or RTC’s No.’s 113 – 116, firstly set-up at Scarborough, followed by Rugby, Ascot and later at Chorley. It was believed that ‘Resocialisation’ should be the main aim, enabling the ex-servicemen to find a suitable job as part of their recovery and reintroduction to civilian life. They were responsible for encouraging a feeling of self-supporting individual responsibility, whilst removing the reliance on the service the the discipline that it imposed. These units continued well into 1946, catering for the many ex-POW’s, including those who later returned from the Far East and were initially intended to be of one month’s duration, but others, like Ken, seem to have been there for up to three months. The courses included factory or commercial or retail institutional visits and social activities to bring the former POW’s into contact with ‘Institutions, individuals and situations towards which he was often burdened with feelings of mistrust and suspicion.’ The course gave free time at weekends and in the evenings for the ex-servicemen to reacclimatize to civilian life. Some 53,000, 31 percent, of the former POW’s attended these courses from the various services. They were allowed to wear either their uniforms or civilian clothes and the only compulsory activities were lectures and discussions focused on changes that had occurred in society over the period of their imprisonment. A wide range of educational and vocational courses were on offer and much emphasis was placed on getting the men involved in sports. 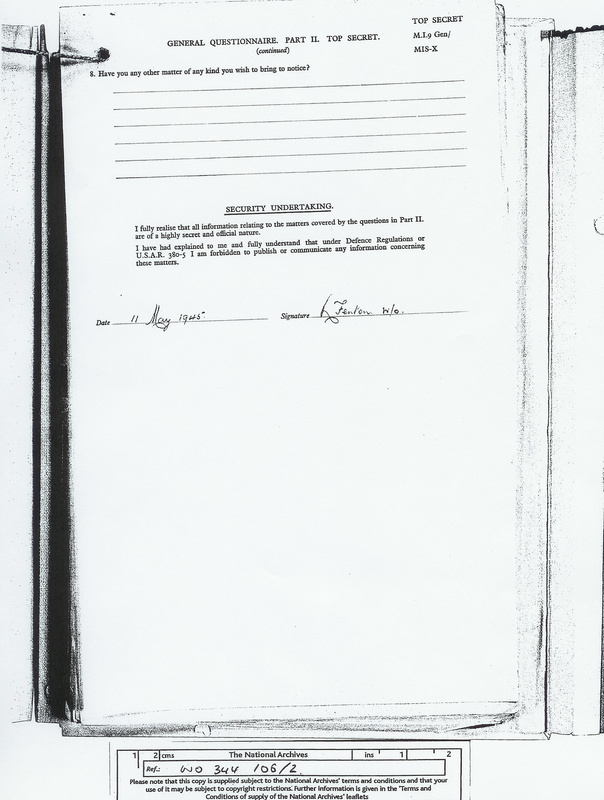 As noted above, Ken attended 115 RTC at Ascot for a period of three months from July 1945 but it is believed he was ‘billeted’ in the Walton-on-Thames, Chertsey or Shepperton area as he retained a fondness for this location where he later returned to work. Ken spoke seldom about his war, but was very keen on revisiting Thames side pubs at Walton, Shepperton, Chertsey, et al. 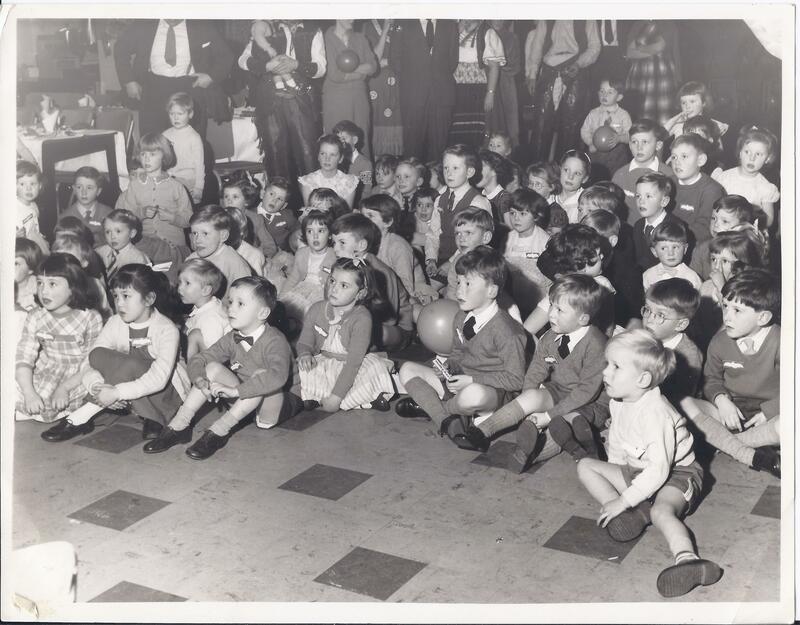 The RAF ‘Kriggies’ were apparently rehabilitated somewhere in the area of the pubs and l assume they had fun and parties which they would have enjoyed. Following this rehabilitation, it states on Ken’s service record that he was attached to 104PDC (Personnel Despatch Centre, Hednesford, Nr. 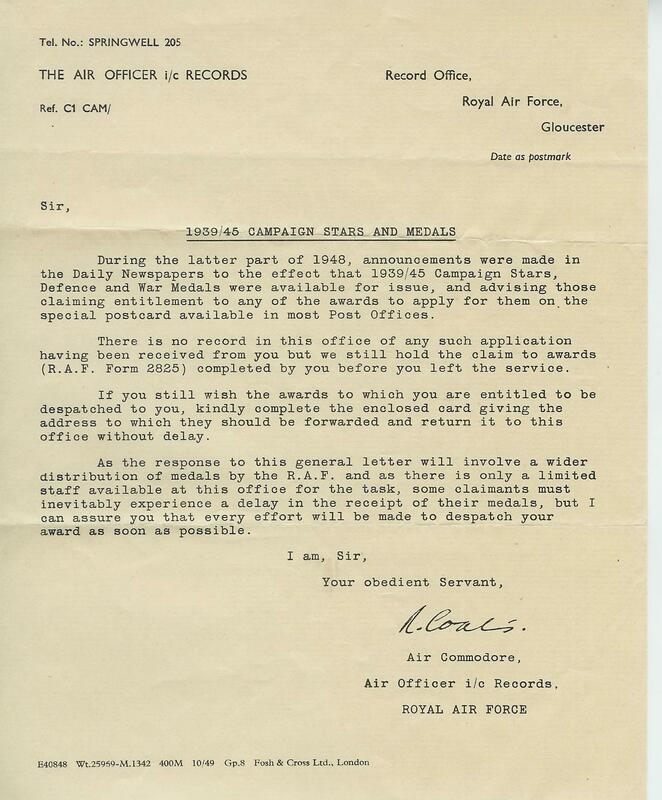 Cannock, Staffordshire) on 16th October 1945, when he would have received his official discharge. Ken returned to BOCM in Selby after the war, when he met and married Nancy Baker, building his own bungalow in Mill Lane, Brayton, Yorkshire, which he named Mill Dene after Mill Dene Gardens which he obviously visited when he was stationed at either Bicester or Brize Norton as, located at Blockley, Moreton in Marsh, Gloucestershire, it was nearby. 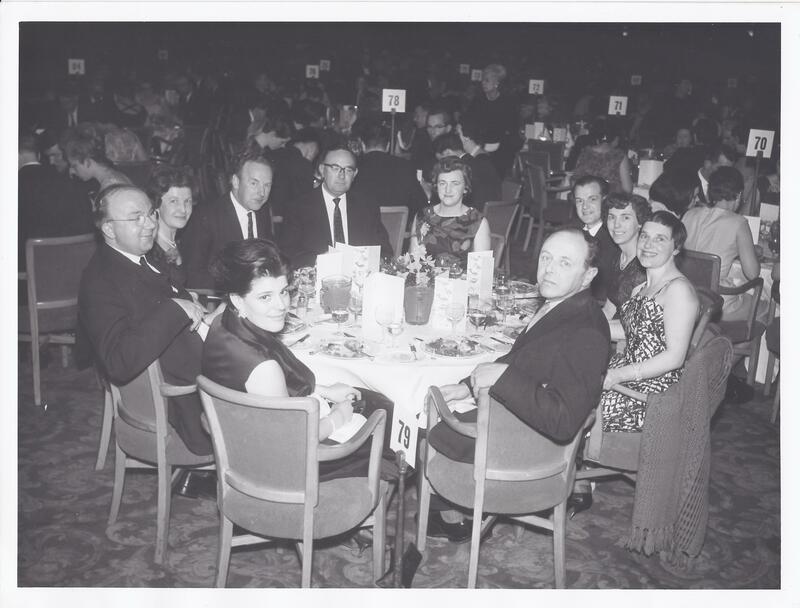 However, with two children now as part of his responsibility, he secured a job at Birds Eye Foods in Walton-on-Thames, then part on Unilever, and relocated his family in 1960, first to Walton, before moving to Pyrford. 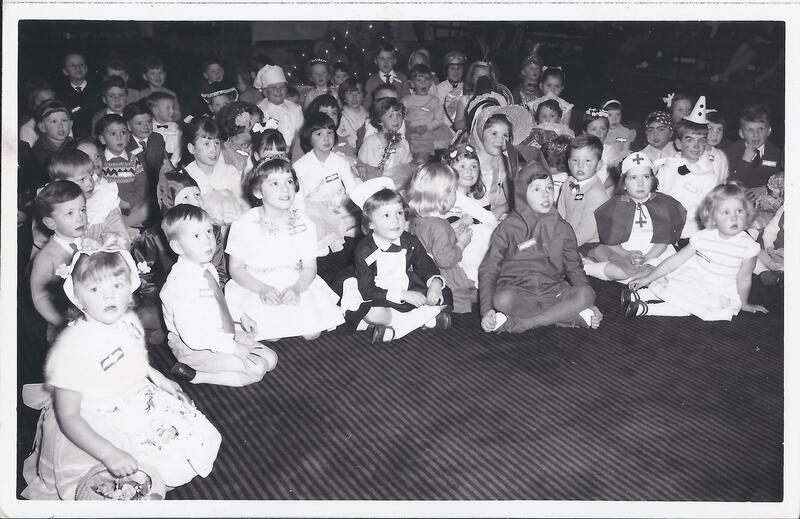 He was employed in the now listed Birdseye Food Head Quarters, now known as Walton Court which was a very modern building for its time, with plenty to keep the staff happy, including flamingos and penguins in the two central areas and crocodiles and turtles in reception. Based on the ground floor, penguins used to distract him from his work by banging on the window with their beak when they were hungry. 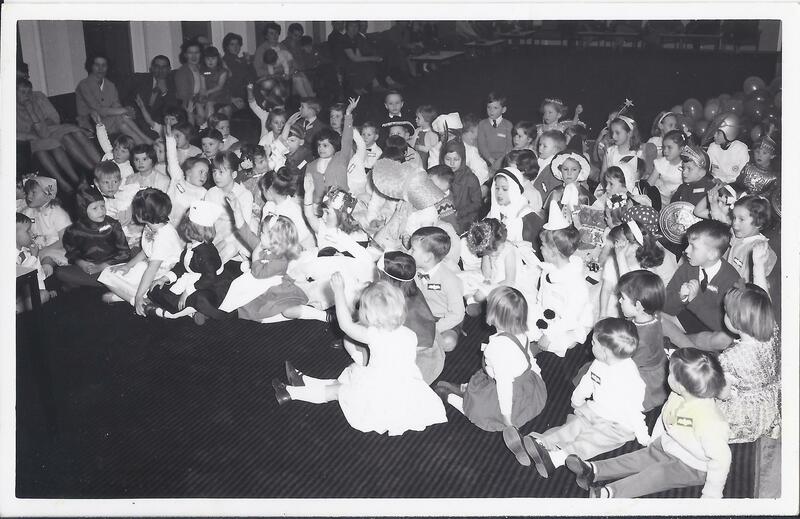 The family remembers fantastic children’s parties and regular visits to the office at weekends when work had to be completed. See news clip. It is impossible to tell this story without including people like Dixie Deans and George Grimson and the rest of the Tally-Ho club, with whom Ken would have had a close knowledge; they are such an important part of the story. George Spenceley recalls visiting Dixie Deans in hospital in Harrogate upon returning home. George’s Father was the local mayor. 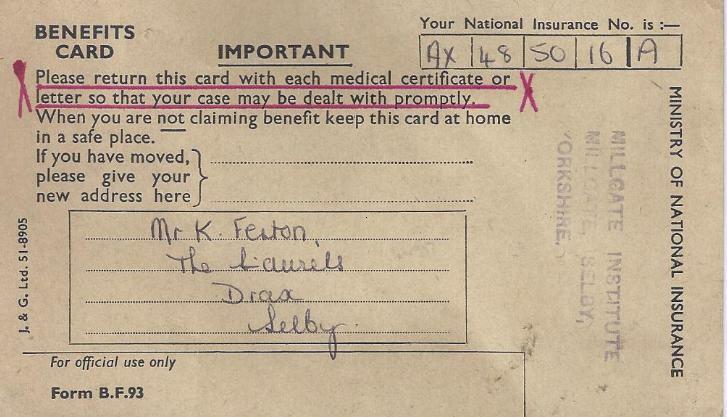 He considered he had been treated properly …………….. No mention of Forced Marches other than (after his repatriation) a walk from Camblesforth bus stop to Drax, with no welcoming committee to provide a lift. During the war, Bomber Command had been a priceless asset to the Governments propaganda machine, demonstrating Britain’s resolve, it’s determination and it’s ability to take the war to the enemy. All of their actions were thoroughly publicised and it’s pilots and crew were ranked as heroes. Their campaign was continuous from the first days of the war when the first raid was carried out by a 139 squadron Blenheim to the last, interrupted only by the weather. This took enormous effort and was carried out at a great sacrifice of life but was honoured by all and the destruction that resulted to the enemy was presented as a vital part of the victory. However, in peacetime, the mass graves, wrecked towns and flattened scenery became an embarrassment and the Bomber crews faded from the official legend. On the 13th May 1945, just as the POW’s returned to their homeland, Churchill broadcast his victory in Europe speech. There was praise for everyone who had contributed to the war effort. Apart from a brief mention of the damage done to Berlin, the main activities of Bomber Command or their crews were not mentioned. There were campaign medals for those who fought in various theatres of war, including the Middle East, Asia, and Europe but there was no specific award for those who fought in Bomber Command, those who had fought so hard to hit Germany and Hitler back for what they had delivered themselves and who had systematically demolished the infrastructure and industry that was supplying the German war machine. The public chose to be very selective in their memory of the war, pushing the bombing campaign to the back of their minds and putting the Fighter Command crew members of the Battle of Britain in a special place, becoming celebrities in films and books. Their battle was relatively short, lasting about 4 months between July and October 1940. They were represented by ‘The Few’ whereas, ‘The Many’, the men who crewed the bombers, their war lasted the full 5 years, some of them as POW’s for this period. Of the 125,000 who passed through Bomber Command, 55,573 were killed and only Guy Gibson and Leonard Cheshire received any real recognition, Cheshire set up homes for those injured Bomber Command crewmembers. Loss and death were an everyday incident supported by that deeply held belief that it would be someone else who had run out of luck, not them who would not return, supported by the many deaths that they witnessed. A belief that would be quickly followed by guilt that someone else had died, not them. Initial justification came from the German Blitz of the British cities over the winter of 1940-41, whereas Bomber Command was also initially the only chance that Great Britain had of putting pressure on the German population and exerting revenge for their early defeats. At the start of bombing operations, small aeroplanes carried small bomb loads to the enemy. In the early days, they dropped these small bombs on small targets causing little damage, whereas later, they dropped them on large targets in the hope they would hit something. The aircrew survived on their whit’s, navigated by the stars and dead reckoning, fought back with single machine guns which had limited range and power and when they crashed, if they survived, had limited intelligence as to how to return to Britain. Our own Blitz on London showed how bombing could in fact strengthen the resolve of the civilians; the ever present Queen Mother was declared by Hitler to be his greatest enemy. This was supported by previous research during the Spanish campaign. In February 1942, 1,001 tons of bombs were dropped compared to 67,637 tons in March 1945, which with the help of the Americans totalled a staggering 133,599 tons. German attacks on Great Britain are estimated to have killed just over 60,000 people, including those killed by the V weapons, whereas estimates of the number of deaths caused by allied bombing range between 305,000 and 600,000 but this takes no account of the psychological effect of bombing on the German people, or more importantly, their army or the factories and industrial plants that were destroyed. One in five German houses were destroyed. These initial actions were thought to be very effective, showing the extraordinary efficiency of bombs raining down on military targets with scientific accuracy; but they were based on the bomber crews own estimates of the damage caused and it was not until about 2 years later that actual aerial photographs showed the hopeless inaccuracy of these raids that demonstrated the difference between the truth and the propaganda. By the end of the war, the RAF could obliterate any target of choice. Initially, these numbers caused little concern as it was seen as a way to end the war that the Germans had started, to deliver the retribution and from the early days of aeroplanes and very primitive bombing operations it was shown that the bomb was as much a spiritual weapon as a physical one, by destroying the will of the workers to work, the army to fight, thereby destroying the authority that was held over the people by the government. Any suffering that the Germans were going through was taken away by the casualties and losses being suffered by the crews of Bomber Command. The Government made no attempt to hide these loses from the public. Behind each airman, there was many more keeping them airborne, in the way of fitters, mechanics, riggers and armourers, together with the many WAAF’s working behind the scenes. Bomber Command was one of the most visible of the services, only surpassed by the army on the build-op to D-Day. 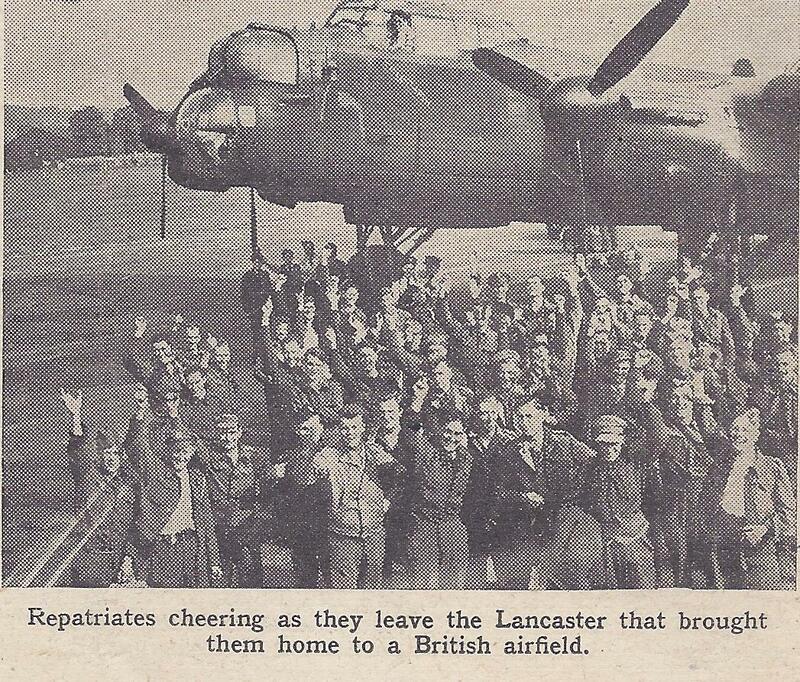 Many of the villages and town around Britain held Bomber Command squadrons, whose crew members integrated with the local people, leaving their memories when they did not return. On the approach routes and over the targets, the crews faced searchlights, flak and enemy fighters, being outside the protection of their own fighter boys and they knew there was no relaxation on the way home and once there, they also faced the dangers of landing a damaged aircraft, amongst others on their own airfield, low on petrol, injured crew members amongst them, tired and glad to be home but able to make the same mistakes as before. There is no answer to the question as to whether the loss of life was an effective and efficient use of Bomber Command’s capabilities and the effect it had on bringing the war to an early end and this will be debated for many more years. The bomber crew really felt little, doing as they were told, releasing bombs from 20,000 feet on a strategic target or an unsuspecting population. They did not see until much later when the war was over what damage they caused. There was no connection, unlike the soldier who shot someone or the fighter pilot who downed another plane, no different to his own, witnessing no parachutes. The bomber crews knew what they were doing and many of the early strategic bombing missions ended in tragedy when the pilot/bomb aimer was so desperate to avoid civilian casualties that they risked their own lives unnecessarily with the ultimate sacrifice and the propaganda told them they were doing a fantastically efficient job. If they could have seen the white upturned faces of people as they flew over Germany as they did as they flew over England, would that have made a difference to their actions. When a memorial was unveiled to ‘Bomber’ Harris on …………… by the Queen Mother, the scenes were not reflective of the times when the Bomber Crews went to war, died for their country or returned as POW’s. There were demonstrators, shouting over the speeches. 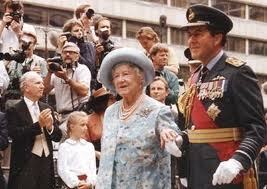 The Queen Mother had to repeatedly stop to allow them to finish. The older contingent of the crowd, stood quietly, not fighting back. They were too old. They came here to remember the times, reflecting on their family, friends and comrades who gave their lives, remembering what they went through, night after night, not knowing if this ‘was the one’. What would Ken Fenton have thought of this? It is very noticeable throughout this research, that few ex-POW’s survived until their latter years. I have spoke to many fighter and bomber pilots as well as army and navy personnel who survived the war, fed on supplies from home, but it is a sad fact that the malnutrition and suffering that the POW’s endured took a great toll on their health and very few of them lasted into their latter years, but there is little doubt that they were better off than the 55,573 casualties of Bomber Command. Another 8,403 were wounded and 9,838 were taken prisoner of war. In simple terms this means a 44.40% chance of survival, ignoring the wounded and captured. The real picture is greater however in that if you take away those training at the time the war ended, the true figure is 65%, the chances of death were appalling. Considerably shorter than that of a comparable soldier in World War II, or intact of a junior infantry officer on the Western Front in the First World War in 1916. Many of the POW’s suffered for many years after their return home, waking up at night dreaming of tunnel collapses, remembering their aircraft’s fate and that of their fellow crew members, many the sole survivor. Considering fellow POW’s shot for trying to escape, the 50 at Stalag Luft III being a famous reminder, but by no means the only casualties. Remembering the losses at Gresse, where fellow POW’s had survived the war in German hands, only to loose their life at the hands of their fellow RAF service men. Few of the ex-prisoners spoke of their experiences. 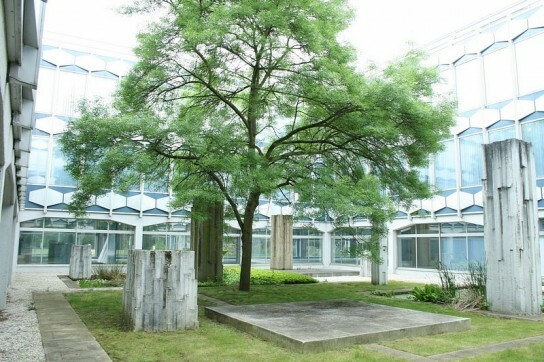 When they got back, there is no doubt they had suffered during their time of captivity and on the forced marches leading to their release but the stories were filling the Newspapers of the Holocaust and the death of up to 11 million people at the hands of the Nazi’s and the conditions in which they suffered, together with other atrocities that occurred throughout Europe. 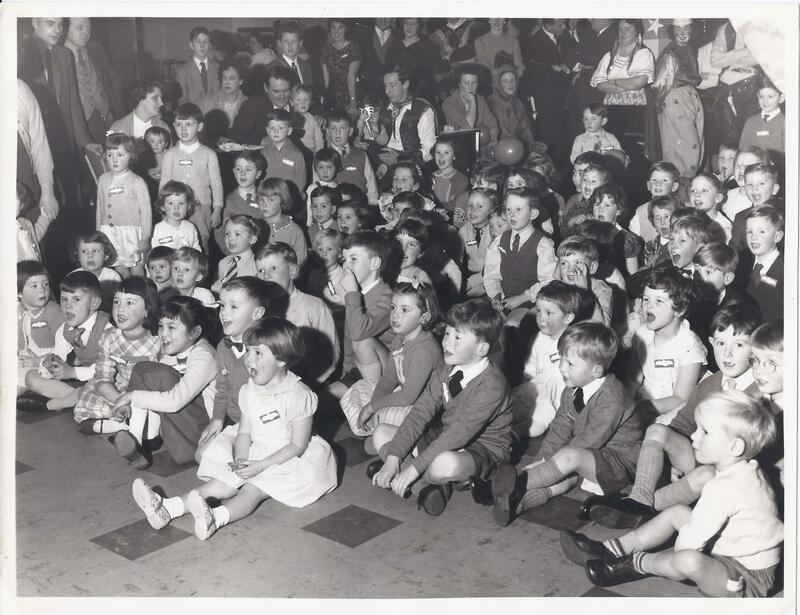 This was followed by the news from the Far East as the returning POW’s and servicemen told their tales of life and death at the hands of the Japanese as they followed Ken and his comrades through Cosford and other reception centres across Great Britain. Many POW’s were mere skeletons of their former selves, having suffered near starvation and dysentery during their captivity and during the marches that followed and their appearance would have been that akin to some of the concentration camp interns and POW’s returning from the Far East but they had not, in the vast majority of cases, been tortured or murdered so they considered their plight to have been secondary and it was therefore overshadowed by these other atrocities. The POW’s in Europe had simply come home. They did not talk about their experiences unless with one another and those who wrote about it did not include much about the other side of their existence. They did not want to talk about it, perhaps through the apparent shame that they may have suffered as they had ‘surrendered’, whilst other colleagues had died. They had already lost their dignity at the hands of the German’s, resorting to a life that they could not have foreseen prior to capture, of humiliation and degradation and they were not about to start telling other people about it. Any stories that they did tell, were followed by words such as “we understand” or “I know what you have been through”, but they did not and the ex-POW’s felt patronised by the comments so stopped telling people about it. Shortly after their return, it became a popular story about the escaping RAF Officers and many stories came out about their exploits and ‘derring-do’, but again, nothing about camp life. The majority of the POW’s had not escaped, it was only a few that succeeded in returning home, many had died trying, but if they could not tell a story of bravery and taunting the enemy, would they tell any story at all? Kenneth Fenton died of lung cancer on 19th November 1976 at Weybridge, Surrey. Alfred George Overill died from lung cancer in 1976. One of Kens greatest regrets was not to be with 139 Squadron when they converted to the De Havilland Mosquito in 1941 or being able to fly one later. He considered this to be the best aircraft around, having seen it over the camps in Germany and heard of it’s attributes from James McCairns prior to his untimely death in 1948. 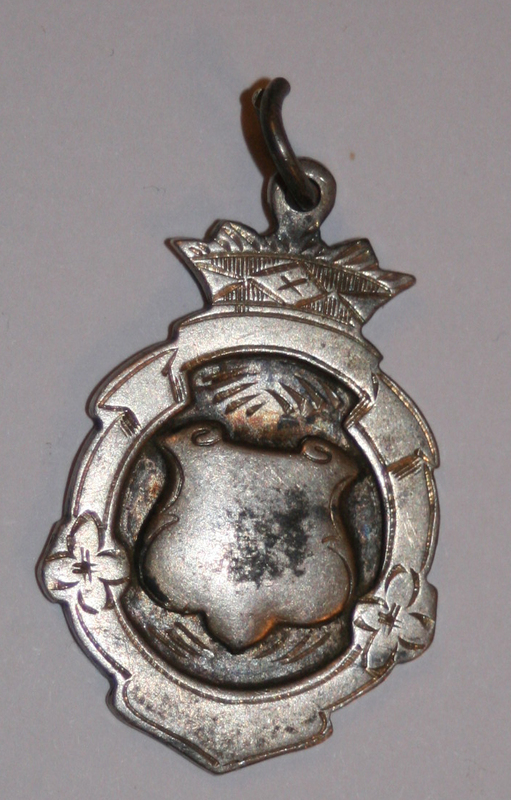 A medal we found in his possessions following my Mothers death, on the back inscribed ‘Snaith Cricket League Winners 1947’. His watch, also found in his possessions, which we never knew he had. 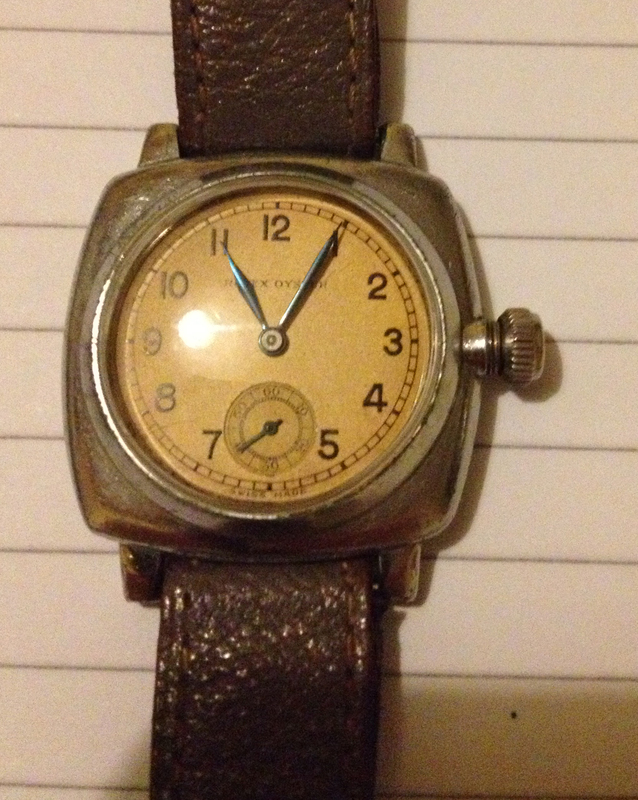 A Rolex Oyster 2081, dated around 1939. Could this have been ‘purchaed’ on credit during the war from Rolex?